The historic landscape area of Rhossili Down covers the extent of unenclosed common land situated on the western coast of Gower overlooking Rhossili Bay. Rhossili Down is an area of raised ground reaching a maximum height of 190m OD steeply sloping to the west, with an off-centre ridge orientated north-south and more gently sloping to the east. It is clear that this area played a significant role in human activities certainly from the Neolithic period onwards. Two chambered burial tombs (SAM GM207; 93012, 93013; 00121w, 00122w) dating from this period, known as Sweyne's Howes are situated on the eastern flank of the down. Use of the area for the siting of ritual monuments became well established in the Bronze Age as evidenced by the extensive barrow cemetery largely situated along the ridge of the down. The area includes up to twenty known cairns characteristic of sepulchral structures, including ring cairns, of varying size the best preserved of which are scheduled (GM194, GM498). These monuments belong to a wider Bronze Age ritual landscape including Llanmadoc Hill as well as other elevated land in the Gower; it may be that these upland areas were held as 'sacred mountains'. Domestic occupation of the area during the early prehistoric period is hinted at by two lithic flakes (00149w, 02098w) and a burnt mound (SAM GM476; 00021w; 305560), which may possibly also have a ritual nature. Iron Age occupation is indicated in the form of a hut circle (SAM GM487; 00144w; 305524) on the eastern flank. Alternative interpretations of this monument have been presented; these include the possibility of it being a fortified enclosure or 'cashel' (Ward 1987) or even a ring cairn (Edith Evans pers comm). A boundary wall (00147w) running northeast-southwest is located nearby and although of some antiquity an exact date is unknown. Another boundary wall, extending across the main ridge from east to west, may relate to early agricultural practice on the down, possibly dating back to the late prehistoric period by analogy (Ward 1987). During the Medieval periods the open common land formed part of an agricultural system, combining arable sharelands on the lower ground with open access to the common, used by the villagers as grazing land for livestock. 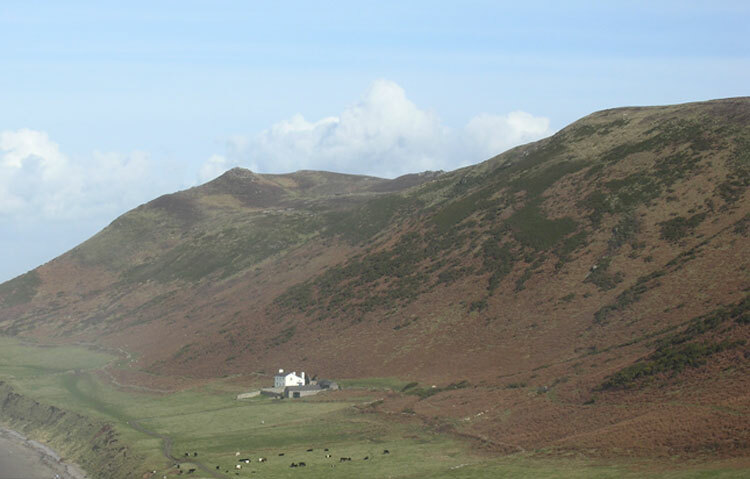 An example of the sharelands associated with Rhossili Down have remained well preserved on The Vile (HLCA030). Enclosures on the Down noted by the National Trust of uncertain date may relate to extending arable practice onto the common; Bessie's meadow may indicate attempts to fence off areas of better quality land, however, this is uncertain. Encroachment of the Gower commons took place from the sixteenth century onwards; this seems to have been piecemeal and minor on Rhossili Down as compared with elsewhere on the Gower. An example in this area are the enclosures around Talgarth's Well (Plunkett-Dillon and Latham 1987b), just southeast of the common and also around Fernhill noted on the 1st Edition OS. Use of the area for grazing sheep continues today. Many parts of the Gower coast were utilised during the Second World War for military training and observation. An anti aircraft defence site ('Chain Home Low Station' 02320w; 310203), located on the western slope overlooking Rhossili Bay is one a series of radar stations once situated along the coast.